The prevailing wisdom, backed by opinion polls, is that the April-May parliamentary elections will result in the Bharatiya Janata Party (BJP)-led National Democratic Alliance (NDA) emerging as the single largest group in the House of 543 members. And a BJP-led NDA regime, with or without Narendra Modi at the helm, will come into being. But opinion polls, pompous punditry in TV discussions, and media blitzes can go horribly wrong, as they did in the case of the 2004 and 2009 elections. There is no guarantee that this time round, they will be right. The opinion polls that were conducted before and after the Pulwama incident and the subsequent air strikes, taken together, actually send mixed signals. At any rate, the polls indicate that the Balakot air strikes have not led to a significant surge in the support for the BJP or Modi. Every poll predicts a shortage of seats from the point of view of forming a government without engineering post-election defections. The India TV-CNX poll, done in the first week of March after the Balakot airstrikes (which were conducted on February 26), gave the NDA 285 seats, which is just a thin majority of 13 seats. Of these, the BJP’s share would be 238 seats. But the BJP-NDA had performed better in the India TV-CNX poll conducted in December 2018, prior to Pulwama and the air strikes. That poll had given the BJP 247 seats! In other words, the India TV-CNX poll taken after the war, showed a drop of nine seats for the BJP despite the Balakot air strike and the media hype that followed! A survey by Zee Group’s Marathi news channel Zee 24 Taas, found that the BJP-led National Democratic Alliance (NDA) might win 264 of the 543 seats. The Congress-led United Progressive Alliance (UPA) might get 165 seats while other parties and independents might win 114 seats. The NDA will still be eight short of a majority. Given the war hysteria, the gap between the nationalistic BJP-led NDA and the not-so-nationalistic Congress -led alliance should be much more. As NDTV’s commentator Aunindya Chakravarty pointed out, the opinion polls were done in the immediate aftermath of the Balakot airstrikes, when nationalist frenzy whipped up by television channels was at its height. But the divide between the NDA and the Congress alliance, even in that context, is narrow and appears eminently bridgeable. In Chakravarty’s opinion, war hysteria could also fade over time, and basic issues like roti (food), kapda(clothing) andmakaan(shelter) could come back to center stage soon enough. Praveen Rai, in a well-researched piece in the Economic and Political Weekly, exposes the hollowness and pretentiousness of opinion polls in India. In the late 1990s, they did show promise but they soon become covert instruments used by media houses in collusion with political parties to come out fake predictions, Rai alleges. According to him, the methodology is patently flawed. It is not suited to Indian conditions, which are highly complex. Here the voting population is divided in myriad ways. They differ from region to region. Caste, class, religion and ethnicity are other factors which determine electoral behavior. Media surveys rarely ever take these variables into account. Media opinion polls on elections in India are not designed to understand or assess the key issues facing the electorate. This is one reason why they go wrong, Rai says. Given the extent and further possibilities of misuse by parties and interests with an axe to grind, Rai has urged the Election Commission to ban pre-poll surveys altogether. Personalities and charisma have always played a key role, if not always a decisive role, in Indian elections. At the moment, Narendra Modi appears to be riding the crest of a wave of nationalism and jingoism, at least in North India. Modi is coming out as a knight in shining armor who had boldly carried out air strikes into enemy territory and who had given instant solutions to pressing problems through grand schemes. In contrast, Congress leader Rahul Gandhi comes out as a mild-mannered person though his attacks on the Modi regime are pinpointed and telling in their own way. But Rahul could upstage Modi in the end, given the fact that Modi’s grandiose claims are beginning to ring hollow against the background of his five-year record of poor performance on the economic front. Society in North India had begun to tear due to the excesses committed by the storm troopers of Hindutva under his watch. However, to make up for its “personality deficiency” the Congress has inducted the glamorous Priyanka Gandhi. She is expected to match Modi’s ebullience and chutzpah to draw crowds to public meetings and families to TV sets. Priyanka’s USP is her novelty. While Modi is over-exposed, Priyanka is a fresh face. As the campaign picks up, she is expected to grab more TV time posing a serious threat to what has been Modi’s exclusive turf since 2014. And Priyanka has been speaking a language totally at variance with Modi’s. While Modi is playing on aggressive nationalistic, jingoistic and communal sentiments whipped up by the Pulwama suicide attack and the subsequent air strikes against Pakistan, Priyanka is calling for a different kind of nationalism based on mutual understanding, religious harmony and peace, a nationalism which is not against any country or community or individual, but is for all. Significantly, this was the theme of her maiden public address in Gujarat, which incidentally, is the home State of Modi as well as the scene of the massacre of 2000 Muslims under his watch in 2002. After coming to power in New Delhi in 2014, Modi has been presiding over an all-India regime under which Muslims in several North Indian States have been lynched for the mere act of selling cows or keeping beef in the refrigerator. Quoting Modi’s line that it is in his fitrat (innate nature) to take badla (revenge), Priyanka said that this does not accord with India’s fitrat which eschews hate and goes for love and compassion. 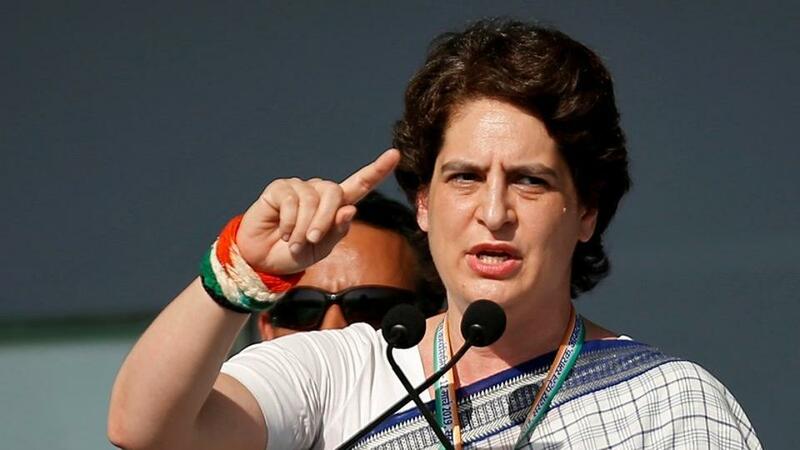 It is yet to be seen if Priyanka’s dovish line will find favor with the voters because the atmosphere is surcharged with hate and animosity to Pakistan and the Muslims. But it is believed that in the next two months (polling is to take place from April 11 to May 19) the memory of Pulwama and the air strikes will necessarily recede, yielding place to less transient and deeper issues like rural and urban economic distress, joblessness and communal disharmony. Priyanka’s message of compassion might eventually find greater resonance. Issues, interests and emotions apart, the arithmetic of alliances will play a critical part in the outcome of the contest. According to BJP stalwart L.K.Advani, it was an inadequate alliance which was the real reason for the defeat of the BJP in the 2004 elections even though it had run a very attractive “Shining India” media campaign, and all opinion polls had predicted the return of the BJP. The BJP appears to be ahead of the Congress in alliance making, at least as of now. BJP leaders like Amit Shah and Ram Madhav are past masters in sewing up alliances. Ram Madhav got the estranged Asom Gana Parishad (AGP) to re-join the Assam cabinet though the BJP and the AGP still have opposite views on the controversial Citizenship Amendment Bill of 2016 which opens the floodgates to non-Muslim immigrants from some Muslim-majority countries including Bangladesh. In Maharashtra, Amit Shah has re-built the broken bridge between the BJP and the Shiv Sena. But the Congress is struggling to make alliances. In a populous State like Uttar Pradesh, the anti-BJP Samajwadi Party (SP)-Bahujan Samaj Party (BSP) alliance has shunned the Congress. In Delhi, the Congress had unanimously decided not to align with the anti-BJP Aam Aadmi Party though it is learnt that efforts are now on to mend fences with AAP. In West Bengal the anti-BJP Trinamool Congress and the Congress may end up competing with each other probably because the TMC might not want to give many seats to the organizationally week Congress. In Kerala, the Congress is going to fight the Left Front even though it needs the two communist parties to fight BJP and Modi at the Center. It is reported that Congress has difficulty in striking a deal with the Sharad Pawar’s Nationalist Congress Party (NCP).